As you consider whom to choose as your log home restoration company, consider what is known about 888-LOG-GUYS. We are the only full-service log home care company in the Midwest. We not only restore log homes but also repair log homes, seal log homes, construct log home additions, and maintain log homes. Our company has been in business since 1999, giving us over 16 years in log home service experience. Is there something else you would like to know, or do you want a free log home restoration estimate? Then call us today, or request a quote from our website! If you have dull logs, gray logs, dark logs, sun-scorched logs, or weathered logs on your log home, then ask 888-LOG-GUYS to rejuvenate your log home or log cabin in the Bowling Green KY area! After we media blast with either glass, sand, corn cob, or walnut shells to strip off the old stain, we can sand it down to make it smooth. Next, we clean the logs with a borate treatment (insecticide) before we add an energy seal in between the logs. Finally, we apply the best product of stain that will leave you in awe as you stare at your log home. Yes, we are that good! If you have logs damaged by log rot, severe weather, bugs and insects, bees, or birds, do not worry! Our crew has repaired or replaced hundreds of feet of log, and we know we can do the same for your log home in the Bowling Green Kentucky area! We have many years in the log home repair business, and we know we can fix your log home! If you are not sure about what needs to be done to repair your log home, then give us a call! The staff at 888-LOG-GUYS are waiting to help you! If you are having issues with insects and bugs coming into your log home, or if you have noticed water leaking down your walls, or if you have felt air drafts coming in around your windows, then don’t delay! Call 888-LOG-GUYS to seal the gaps in between your logs to protect you and your family from the outside elements. You shouldn’t have to put up with pests, water leaks, or air drafts anymore! You can also request an estimate from our website for the Bowling Green Kentucky area! We have the carpentry skills to add structures on your log home that will intensify its beauty and increase its value. If you would like to build a deck, porch, or patio, our staff and crew will work with you to see that it is built just right to fit your needs. If you would like to construct a log staircase, we have the carpentry experience to get it done right. If you would like a log railing added to your home, then ask 888-LOG-GUYS to construct or repair a log railing that will revitalize your log home. We want to see you completely happy in your unique log home! Are you discouraged about how much upkeep a log home takes to maintain good quality? Well, don’t be! 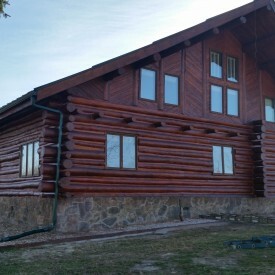 At 888-LOG-GUYS, we know how to maintain your log home in the Bowling Green KY area, and our log home maintenance process will save you a lot of time and money in the long run! Let us do the log home maintenance work, and we will keep track of when your logs need to be cleaned. Once a friend, always a friend! We will always be available to assure your log home is in excellent condition! Call us today or ask for a quote online!